On Tuesday, July 14, a German exchange student, Lena Huster, and her American host. Claudia Campanella, stopped by the Rocky Point Rotary meeting to share their experience. Lena spent three weeks in the United States with her Miller Place host family and had the opportunity to visit NYC and Montauk Point. Lena is looking forward to returning to Germany and bringing her host "sister," Claudia, with her. This exchange was made possible by Rotary and both young ladies are learning so much! Thank you, Tom Talbot, for bringing the students to our meeting so that they could share their experience! 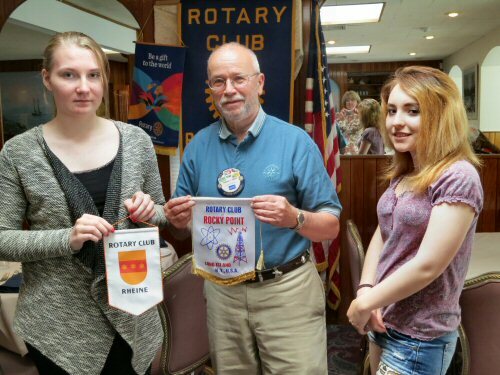 Pictured below are exchange student Lena Huster, Rocky Point Rotarian Tom Talbot, and Miller Place student (and exchange host) Claudia Campanella.